Tokyo, March 12, 2018 --- Hitachi, Ltd. (TSE: 6501, Hitachi) and University of Utah Health (U of U Health), a leading institution in electronic health records and interoperable clinical information systems research, today announced the joint development of a decision support system that allows clinicians and patients to choose from available pharmaceutical options for treating type-2 diabetes mellitus (T2DM). The system uses machine-learning methods to predict the probability that a given medication regimen will achieve targeted hemoglobin A1c (HbA1c)*1 levels, a common indicator of disease control for diabetes. 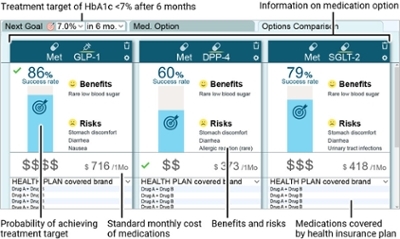 The system compares medication regimens side-by-side, predicting efficacy, risk of side effects, and costs, in a way that is easy for both clinicians and patients to understand. The system is integrated with electronic health records using Health Level 7 (HL7®) interoperability standards, making it seamlessly available to clinicians and allowing for guidance that is personalized to the individual characteristics of the patient. By facilitating patient-clinician communication and supporting shared-decision making, the goal is to make sure that patients are fully engaged and committed to the treatment plan. Hitachi and U of U Health will pursue collaborative research aiming for clinical trials using this system. In the United States, the number of patients with diabetes has risen to 23.1 million, and one in four persons aged 65 years or older is diagnosed with the condition. Unfortunately, about half of these patients fail to achieve the treatment target (<7% HbA1c) set by medical guidelines. Further, some patients forego certain treatments because they cannot afford them due to insufficient health insurance coverage. Within the last few years, health care providers have been emphasizing a shared decision-making approach to medical care – where patients are involved in deciding their own course of treatment rather than simply following a physician’s or pharmacist’s treatment plan. The new system helps clinicians and patients to discuss different options available to them. It not only provides information on the efficacy of each drug but also takes into consideration other information important to patients, such as side effects and cost. The machine learning-based pharmacotherapy outcome prediction and comparison technology, developed in collaboration between Hitachi and U of U Health, and announced last November*2, was integrated into a standards-based clinical decision support system developed at U of U Health (OpenCDS*3). By employing HL7® FHIR®*4, a next generation standards platform that facilitates interoperability between electronic health record systems, the new drug selection support system can be linked to HL7 FHIR-compatible electronic health records. During development of the new system, the number of data sets and items were increased, improving the predictive accuracy of the technology. *5 This system can also be utilized as a platform to connect electronic health records with various machine learning based models. Hitachi and U of U Health will conduct joint research to evaluate the efficacy of this technology with the ultimate goal of improving care and outcomes of individuals with diabetes. A part of the results from this work will be presented at the American Medical Informatics Association (AMIA) 2018 Informatics Summit to be held from the 12th to 15th of March 2018 in San Francisco, U.S.A.
*1 HbA1c (Hemoglobin A1c) value: Laboratory test value that reflects average blood sugar level for the past three months. It serves as the main indicator of disease control for diabetes, the target value for which is decided by the clinician for individual patients based on age and patient condition. *3 Open Clinical Decision Support (OpenCDS) is a standard-based open source clinical decision support system developed by the University of Utah. *4 FHIR® - Fast Healthcare Interoperability Resources is a next generation standards framework created by HL7® - Health Level Seven International, a healthcare standards development organization. *5 Area Under the Curve (AUC) of 0.88. AUC is used in statistical data analysis as an index of decision and classification accuracy using a value ranging from 0.5 to 1, with 1 representing the highest accuracy of 100% probability of correct decision and classification. University of Utah Health is the state’s only academic health care system, providing leading-edge and compassionate medicine for a referral area that encompasses 10% of the U.S. A hub for health sciences research and education in the region, U of U Health has a $291 million research enterprise and trains the majority of Utah’s health care professionals at its Schools of Medicine and Dentistry and Colleges of Nursing, Pharmacy and Health. Staffed by more than 20,000 employees, the system includes 12 community clinics and four hospitals. For eight straight years, U of U Health has ranked among the top 10 U.S. academic medical centers in the Vizient Quality and Accountability Study, including reaching No. 1 in 2010 and 2016.